The GCM12SD is Bosch’s new and improved miter saw that promises to deliver unmatched smoothness and durable precision in a relatively compact body. Featuring Axial-Glide, the saw functions by pivoting the flexible arm at the same level as the saw’s rear. This helps save close to 12 inches of work space compared to a conventional miter saw that has a sliding compound system. This also ensures the saw can be operated with almost zero clearance behind it. In this best 12″miter saw review, we’ll find out how does the GCM12SD manages to provide wider cross-cuts, smooth glide, and enhanced alignment for life. Usually, the saws that elongate on slides could deflect on the angle when approaching the cut limit. There’s no such issue with the GCM12SD. Compared to other similar saws in its category, such as the Makita, the Bosch is surprisingly quiet when at work. Not just quiet, the saw is also among the easiest saws to repair. Miter saws are not known for offering high-quality blades along with the product. 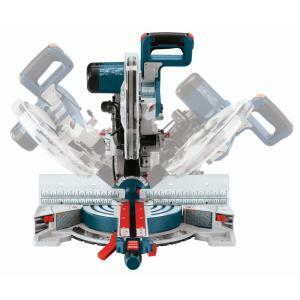 However, of all the miter saws, the Bosch GCM12SD tends to provide the best blades in the box. The GCM12SD is quite expensive, since it’s supposed to be for professionals, who require the best hardware packed in. All those top-notch components built in to the saw don’t come cheap. Also, it’s Bosch! The bag that’s supposed to collect sawdust doesn’t do a really good job, making the indoors quite a mess. When using the saw, you’ll require some serious mechanism to control dust. The weight can be an issue for people who plan to use this saw as a portable tool. The saw is heavy; however, it shouldn’t be a problem if it’s used the way it’s designed to be used, which is setting it up at a place permanently. • Is there a depth stop on this saw for creating a dado? Yes, the saw has that adjustment feature. • What is the blade arbor’s size? The blade arbor size is an inch. • Are there crown stops? Crown stops aren’t available right out of the box. You may, however, get them as an additional accessory. • Does the detent system have plastic? Yes, it has got plastic. However, the plastic is extremely solid and is 95 percent perfect for 99 percent of cuts. • What blades come with the saw? A mid-quality, decent blade comes in the package. You can, however, replace it with a more efficient, high-quality blade. The Bosch GCM12SD, as aforementioned, is meant for professionals or people who have some good experience handling and working with such machines. This is because to derive the best performance from this machine, one would have to make some adjustments, which an amateur cannot. The performance and power is great; durability is excellent as well. And the fact that it’s a Bosch, getting aftermarket components for this machine won’t be an issue. Long story short, the Bosch is probably the best 12″ miter saw money can buy right now.